actually has much in common with sculpting. I used to paint more often. I don't recall the last time I picked up a paintbrush for any serious effort, or (sadly) even any of my numerous pencils for a serious attempt at drawing. For a long time, ink drawings were more enjoyable for me, with their dramatic contrasts of black on gleaming white paper. But with paint, pencil, or pen, I am applying a medium onto the surface of the paper or canvas. I'm adding to what is there, and that is where it differs drastically with pyrography. In pyrography, the only medium I am applying is heat. Nothing else. When I touch the burning pen to the surface, I am adding nothing that wasn't already there. I am not covering the wood with any artistic medium, but rather transforming it, bringing out all the shades and tones that are already there potentially, waiting to be revealed. 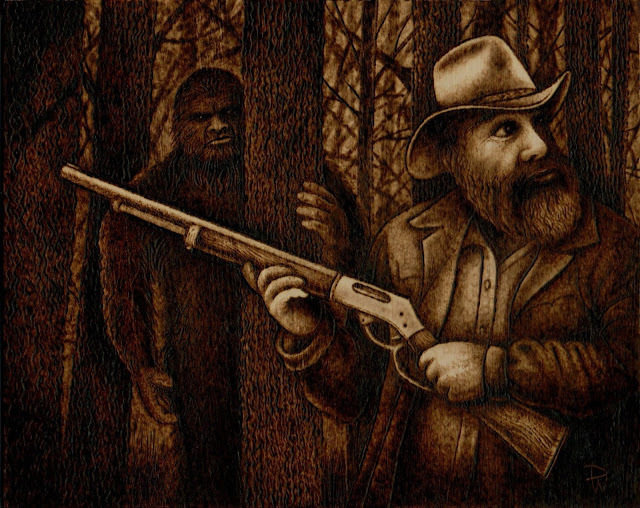 Just as a sculptor shapes the clay, or a carver whittles away the wood to find the beauty within, a pyrographer doesn't change the medium, but transforms it according to his or her artistic vision. 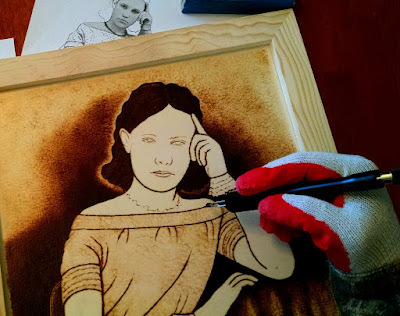 Call that pretentious or grandiose if you will, but the simplicity of wood and heat, and the magic that happens when they meet – that is one of the things I love about pyrography.